Reverse Rett are a Manchester-based national charity raising funds to purchase numbing cream for vulnerable children and adults with Rett Syndrome who are taking part in clinical research. Babies with Rett Syndrome are born apparently healthy and start losing their speech and the use of their hands between 18-24 months. Many children later lose any acquired mobility. Difficulties with breathing, eating, circulation and high anxiety are common. All are at risk of sudden and unexplained death. A clinical trial of a treatment aimed at regulating breathing difficulties in children and adults with Rett Syndrome is currently taking place at King’s College Hospital in London. On a number of study days, children and adults with Rett must undergo a number of painful blood draws. Patients with Rett often have tiny veins which collapse quickly, and must often undergo several difficult attempts. Please help us provide numbing cream to the trial site for those involved in this vital research. 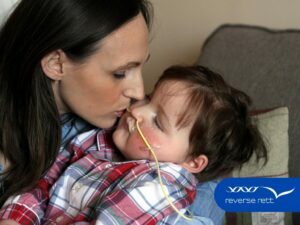 Reverse Rett are raising money with the Buengo App. Download the app from the App Store or Google Play Store and post an item for sale to support this cause!